It was like pre-ordained, man. No sooner did Haze ship me one of their new vaporizers for a product review than Grizzly Originals did the same with theirs. And that meant it was time for a serious head-to-head, no-holds-barred product slugfest, because both of these new vaporizers handle not only the legendary “dry herb”, but also oil (OK, wax/oil/shatter) and even e-juice. They both do it properly, there’s no burning here! But although they both have many things in common, they couldn’t be more different. The Grizzly Guru is the new kid on the block; it’s the first product from international retailer Namaste Vapes, who started up an entirely new company just to create these vapes and related accessories. The Guru is designed around a solid, palm-sized and computerized module with a whopping 5200 mAh of battery power and a multipurpose digital readout. Yes, you can set it to 420! If you slide on the herb module, you’ll be vaping your herb out of a completely ceramic chamber and a glass mouthpiece, using the buttons on the base module to set the temperature anywhere up to over 450°F by degree. If you slide on the adapter module, you can attach either a wax/oil mouthpiece with ceramic atomizer, or an e-juice clearomizer – both of which are included – or use any 510-threaded one you already have. In this case, the base module buttons adjust the exact voltage going into the atomizer, just like a fancy custom modded vape. The Guru also comes with a cleaning brush and wipes, funnel for loading, and wall charger (which lets you vape while you charge), and costs less than $200 with a 1 year warranty (does not cover glass or batteries). The Haze V3 is the latest incarnation of the well-received line of Haze vaporizers. 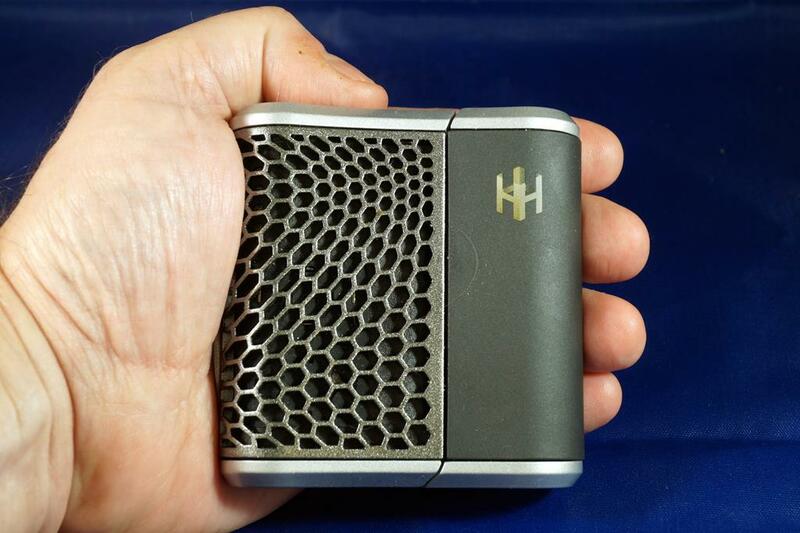 The Haze also has a unique design, but one quite different from the Guru. First off, it doesn’t look anything like a vaporizer, more like a luxury mini-flask or puzzle box. But when you open it up, it reveals its secret: not one, but two separate heating chambers, in which you can load herb and wax, or indica and sativa, or two of almost anything! Each chamber can hold anything the Haze can vape, and an assortment of inserts let you use e-juice, wax/oil, and even choose between convection and conduction for your herb. To use the Haze, you load the chamber, then flip the cleverly disguised switch either way to turn the unit on. Each direction is marked to correspond with the chamber that will be activated, and while it’s heating up, the hidden mouthpiece is revealed. Pull it up with your fingers and you can start inhaling; there’s plenty of vapor even before it’s up to temperature. The temperature is set by pressing another hidden button to one of four useful heat ranges, and indicated by a row of hidden LEDs. The Haze V3 comes with both a stainless steel and glass mouthpiece, a number of assorted screens, separate loadable cans for herb and concentrate/e-juice, a cleaning brush, tweezers, two 2600 mAh batteries, and a wall charger. It has a 10 year warranty and lists for $250. These two have quite a bit in common. They’re both in a similar price range, and designed for people who use cannabis in multiple forms while on the go. The herb capacity of both vapes is identical, as is the total battery capacity, and both units even have optional adapters for water pipes. Both these units have that well made feel, and have plenty of airflow. So although it’s always recommended to grind your herb, if you’re in a hurry you can just cram the chamber with torn-off pieces of nugs and it will work just fine. You can “pre-pack” it too, and nothing will fall out when they’re loaded up, so you can just carry it around and be ready for action. Battery: the Guru lasts far longer on one charge, but the Haze uses standard replaceable batteries that are easy to switch in a few seconds. Tie score. 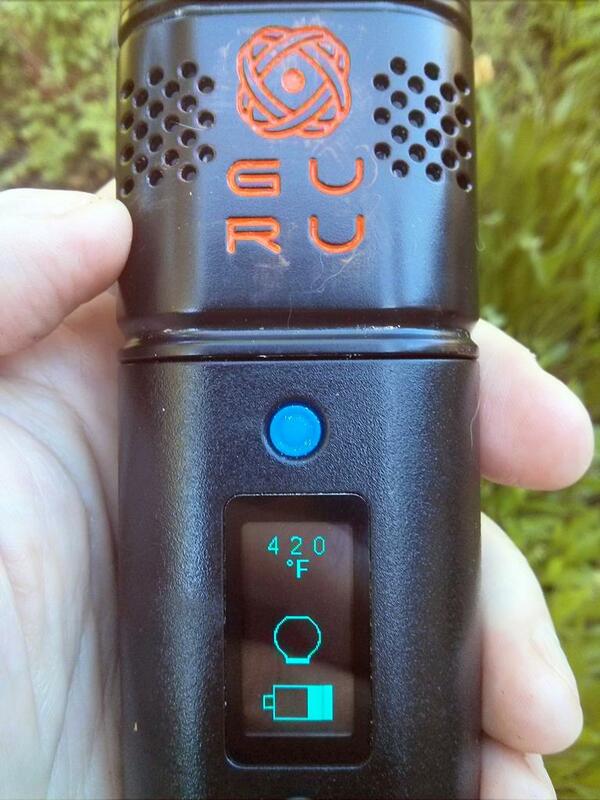 Portability: the Haze is much smaller than the Guru and has no exposed glass to worry about, though they weigh nearly the same. Advantage: Haze. Usage: the Guru takes 36 seconds to heat up to 365°F from room temperature, the Haze about twice that; both quite acceptable times. On the other hand, you have to turn the Guru on and then tell it to start heating, whereas the Haze starts heating as soon as you turn it on. Tie score. Taste: this is more subjective, but even after weeks of breaking it in, the Haze never tasted quite as good as the Guru, which was amazing from Day One. Ceramic really makes a difference! Advantage: Guru. As a medical marijuana patient with a low tolerance, I found that the fine temperature control of the Guru let me more carefully adjust the effects I got, while the Haze repeatedly got me high af every time. I really like both of these vaporizers, and find myself using one or the other every day…sometimes both! So I don’t think you can go wrong with either one. Thank you for such a concise, inclusive review, especially on a couple of relatively affordable vaporizers from companies without huge advertising budgets, yet at least. You may change that! Ha! Thank you. Nugs and hugs! Hi Old Hippie, I’m wondering how you think both of these vaporizers compare to the MFLB? They’re quite different! The MFLB is a kind of organic, personalized, almost hipster product. There’s a long learning curve to “get it right”. But it’s awesome for microdosing. These two are basically “fire it up and inhale”, use up a bit more weed in the process (because they’re conduction-based) and more suitable for casual users or for small groups.